Small, yet functional, the Case PRO I contains all the features of the larger Case controllers, ideal for club installations and small to medium size productions. 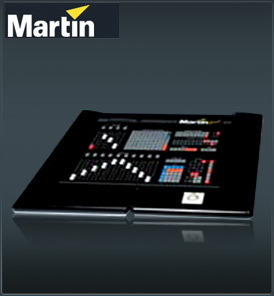 Used internationally in touring, rental and musical applications, multimedia shows, large clubs and theatre installations, Martin Case Pro consoles are durable lighting desks which have provided years of service to the market for lighting control. Case control desks allow the lighting designer to view the fixture set-up graphically, on screen, for easy identification. The easy to use fixture library contains all well-known lighting brands. [read more...] For live control each playback can be controlled manually or programmed with individual fade-in and fade-out times resulting in very smooth cross fades. Automated programming is an indispensable aid to the rapid creation of a show. Many of the most imaginative lighting effects are naturally complicated and time consuming to program, yet Case Pro consoles are capable of automating many of these advanced effects through a unique Effects Generator, allowing a programmer more time to be creative.